But it hasn't all been plain sailing. In fact, it's been decidedly choppy. From an export perspective, certain cartel members have made a concerted effort to keep crude off the market, while others have blatantly not. Saudi continues to lead the way in terms of compliance - and they have the most to #win. 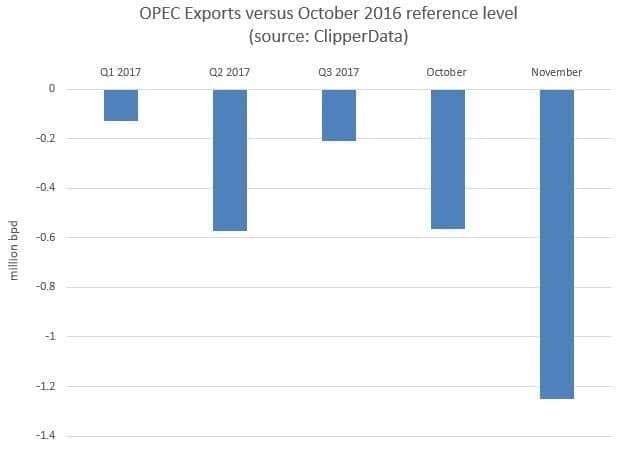 Versus last October's reference level, OPEC exports have dialed back by an average of 300,000 barrels per day over the first three quarters of this year. Saudi Arabia is accountable for a large chunk of this, exporting around 260,000 bpd less over the period. While others have also reined in exports, increasing flows from the likes of Libya and Nigeria have offset these efforts. Although Saudi exports have ticked higher in the last couple of months, exports have dropped from other members instead. This has been out of necessity, as opposed to complicity. As the Venezuelan economy descends into chaos, its exports have dropped as production falls to near 30-year lows. Meanwhile, Iraqi exports have come off amid a conflict in the Kurdish region of northern Iraq. Elsewhere, Iranian and Libyan shipments have dropped amid production issues. All this activity (well, inactivity) has ushered November exports so far to their lowest monthly level since mid-last year. This drop in flows to the US has played a key role in helping OPEC on its way towards its ultimate target: the 5-year average for OECD crude and product inventories. 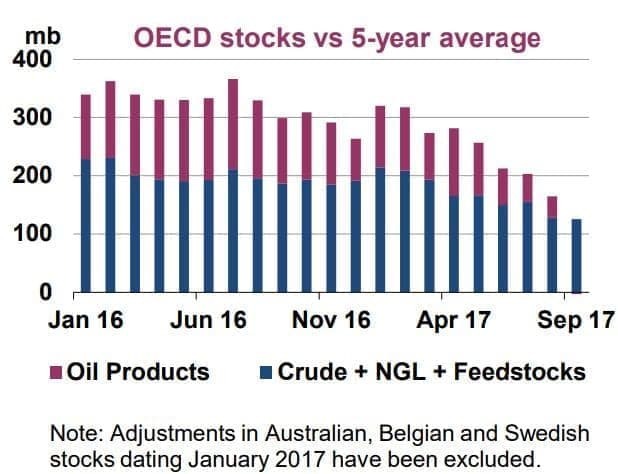 According to the IEA, stocks in September declined versus the 5-year average for a fifth consecutive month, dropping to their lowest level in almost two years at 2.97 billion barrels. 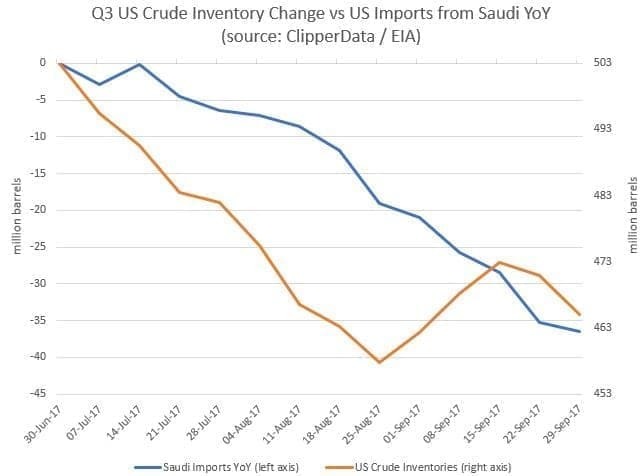 Bearing in mind what we have seen in terms of OPEC exports in the subsequent two months since, OPEC - and Saudi in particular - have the right to feel like they are #winning. The only thing that will bring pricing down is lies from importing countries.. The consensus is higher.